Deal Book. 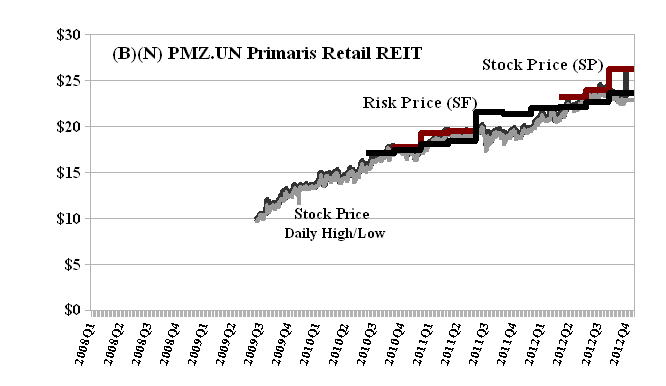 Primaris Retail REIT is on the block for an unsolicited offer of $2.6 billion in cash which amounts to $4.4 billion on the assumption of the Primaris debt ($1.8 billion) which is then reduced by an estimated $1.1 billion on the sale of certain Primaris properties to a third party so that it looks like a $3.3 billion net deal to us although the Primaris unit holders are being offered a flat $26 per share which would value all of the stock if tendered at $2.6 billion, as stated. And, after all, one doesn’t want to confuse the shareholders, do we? (Reuters. December 5, 2012, Canada’s KingSett leads C$2.6 billion bid for Primaris REIT). It’s clever to sharpen our pencils but now we need to sharpen our wits and we need to ask, Why should we buy into this deal? What’s in it for us except cash (net of taxes withheld) that we then need to re-invest or lose out to inflation and the other problems of cash that we thought that we had already solved with our investment in Primaris (please see Exhibit 1 below). The current dividend yield on Primaris is more than 5% and the dividend rate is $0.102 (10¢) per share per month (or $120 million per year in total) and a lot of us bought those shares for between $15 and $20 two years ago. Where can we now invest $20,000 (or 1,000 shares at the time) and expect to get $102 per month or $1,224 per year, for it? The deal makers have volunteered the information that “This all-cash offer is an attractive opportunity to obtain immediate liquidity in the face of economic uncertainty and volatile markets.” Indeed. But, as investors, “liquidity” is not our problem. What we want – and what we seem to have – and what we “like” is that our capital should be provably safe and obtain a hopeful return above the rate of inflation. As to capital safety, we note that the stock at $23 (yesterday) is already up 10% for the year and our estimate of the downside based on volatility alone is minus ($1). Moreover, the market for put options (please see our Post, The Wall Street Put, August 2012) at $26 for January has vaporised and is now asked at $0.40 per share, down from $3.20 just last week. They might be worth something if the deal doesn’t go through at $26 or better, one would think. Primaris Retail Real Estate Investment Trust (REIT) is a real estate investment company that directly or indirectly owns, manages, leases and develops retail properties in Canada. Primaris Retail REIT owns more than thirty properties in cities across Canada, including the Dufferin Mall in Toronto, the Cornwall Centre in Regina, Saskatchewan, the Tecumseh Mall in Windsor, Ontario, and the Woodgrove Centre in Nanaimo, British Columbia and more than a half dozen Zellers outlets that are now being converted into Target stores. Their tenant list includes household names such as the Hudson’s Bay Company, Canadian Tire Corporation, Reitmans, Sears Canada, Target, Shoppers Drug Mart Corporation and many others. Please see our Posts on some of these companies and their current “deals”.